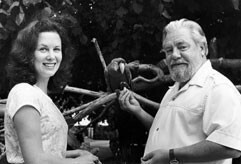 At the end of July 1987, Gerald and his wife Lee flew out to Corfu to watch the filming of the BBC ten-part series of My Family and Other Animals. Douglas Botting refers to the trip towards the (rather rushed) latter section of his (rather good apart from the rather rushed latter section) biography of Durrell, noting that the BBC had some problems with filming because Corfu had changed so much since Gerald’s idyllic childhood there in the 1930s. On this trip, Gerald appears to have been so upset about the changes – something he remarked on during previous visits to Corfu (known colloquially as “Cor, Phew” in Britain in the late 1980s, if my childhood memories serve)- that he was moved to write an article about the devastating effect of tourism on the island and its wildlife for the Sunday Times newspaper, published as part of its Impressions in the Sand travel series, around July 1987.